Connect your embroidery card reader using the build-in USB port on your Quattro™ NV6000D. 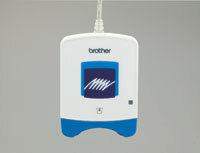 This Embroidery Card Reader is compatible with the entire library of Brother Embroidery Cards, including licensed content. The simple and easy USB attachment takes seconds to connect and ensures your treasured collection of designs will work beautifully in our new Quattro NV6000D™.